Stephanie Jayne Houghton MBE (/ˈhɔːtən/; born 23 April 1988) is an English footballer, who both plays for and captains Manchester City and the England women's national football team. Since her debut in 2007, Houghton has played over 100 times for the England national team. She suffered serious injuries immediately before the 2007 World Cup and Euro 2009, but recovered to play in the 2011 World Cup and Euro 2013. She was made England captain in January 2014. Houghton came to prominence at the 2012 London Olympics, scoring three goals in Great Britain's four games, including winners against New Zealand and Brazil. At club level Houghton started at Sunderland in her native North East England before moving on to Leeds United in 2007 then Arsenal Ladies in 2010. An extremely versatile player, she broke into the Sunderland team as a striker before moving back into midfield and later into defence. Houghton was appointed Member of the Order of the British Empire (MBE) in the 2016 New Year Honours for services to football. Houghton began her career five years at Sunderland. She helped Sunderland to win promotion from the Northern Division in 2005–06 and then won the FA Young Player of the Year Award in 2006–07. After Sunderland were relegated that season, Houghton became a target for Arsenal and Everton. She eventually joined Leeds United Ladies. After helping Leeds win the 2010 FA Women's Premier League Cup, Houghton signed for Arsenal in August of that year. In April 2012, Houghton was appointed as one of eight digital media ambassadors, one from each team, who wear their Twitter account name on their shirt sleeves to raise the profile of the WSL. 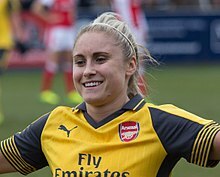 On 5 December 2013 it was announced that Houghton had signed an agreement to leave Arsenal for new WSL side Manchester City on 1 January 2014. Houghton was involved with England at U16 schools, U19, U20, U21 and U23 level. She was called into the full squad for a match against Germany on 25 October 2006, when Katie Chapman withdrew with an illness. She was an unused substitute in the 5–1 defeat in Aalen. Houghton made her debut in the next match, replacing Emily Westwood after 73 minutes of a 6–0 win over Russia in Milton Keynes on 8 March 2007. Her first start came three days later, in a 1–0 win over Scotland at Adams Park. She missed the 2007 World Cup with a broken leg and Euro 2009 with a damaged cruciate ligament. In May 2009, Houghton was one of the first 17 female players to be given central contracts by The Football Association. 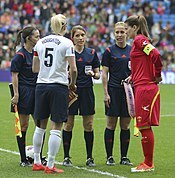 Houghton played in all three games at UEFA Women's Euro 2013 as England finished in last place: "a massive disappointment personally and collectively as a squad." In January 2014 she was named the new captain for England's team under coach Mark Sampson, beginning on a 1–1 draw with Norway. For the 2015 World Cup in Canada, Houghton was again named England's team captain. Houghton scored her first World Cup goal against Norway in the round of 16, and was chosen Player of the Match during the quarterfinals with Canada, which qualified England for their first semi-finals ever. Houghton earned her 100th England Cap on 11 November 2018 against Sweden at New York Stadium in Rotherham, South Yorkshire. Houghton was called up to the first Great Britain women's side for the 2012 Summer Olympics as a defender. She became the team's record goalscorer from the left–back position, scoring in all three group games to help Great Britain to win the group with a 100% record, as well as making important challenges to help ensure the side progressed without conceding a goal. Houghton was also named left back of the tournament due to her outstanding performance during the games. Scores and results list Great Britain's goal tally first. In October 2014, Houghton made history by becoming the first female player to be on the cover of Shoot magazine. Houghton is married to former Bolton Wanderers defender Stephen Darby. They married on 21 June 2018. On 18 September 2018, Darby announced his retirement from professional football at the age of 29 after being diagnosed with motor neuron disease. ^ "List of Players" (PDF). FIFA. Retrieved 4 October 2010. ^ Alan Hubbard (22 May 2011). "Houghton is football's Jill of all trades". The Independent. Retrieved 30 May 2011. ^ "Stephanie Houghton". The FA. Archived from the original on 31 July 2017. Retrieved 13 June 2017. ^ "Stephanie Houghton". Soccer Way. Retrieved 13 June 2017. ^ "No. 61450". The London Gazette (Supplement). 30 December 2015. p. N20. ^ "Steph Houghton: England star, role model, leader". BBC Sport. 5 June 2015. ^ a b "Young star Steph joins Leeds". 30 July 2007. ^ "Houghton and Nobbs join Arsenal". UEFA. 1 August 2010. Retrieved 13 November 2010. ^ "Women's Super League launches Twitter kit initiative to raise profile". BBC Sport. 4 April 2012. Retrieved 10 April 2012. ^ "Steph Houghton signs for City". ManCity.com. 5 December 2013. ^ "Germany Women 5–1 England Women". BBC. 25 October 2006. Retrieved 28 May 2010. ^ "England Women 6–0 Russia Women". BBC. 8 March 2007. Retrieved 28 May 2010. ^ "England Women 1–0 Scotland Women". BBC. 11 March 2007. Retrieved 28 May 2010. ^ Leighton, Tony (14 May 2009). "Steph Houghton rejoins England squad after two years of injury agony". The Guardian. London. Retrieved 29 July 2009. ^ "England Women awarded contracts". BBC Sport. 10 January 2010. Retrieved 28 May 2010. ^ Moore, Leigh (29 August 2013). "Houghton's Euro pain eased by Arsenal form". BT Sport. Retrieved 21 January 2013. ^ Wilson, Scott (19 January 2014). "North-Easterner Houghton expresses pride at captaining England". The Northern Echo. Retrieved 21 January 2013. ^ Lavery, Glenn (11 May 2015). "England squad named for FIFA Women's World Cup". The Football Association. Retrieved 12 May 2015. ^ "England comeback sinks former champs". FIFA. 22 June 2015. Retrieved 28 June 2015. ^ "ENGLAND 2–1 CANADA". FIFA. 27 June 2015. ^ "Triple goal scorer Steph Houghton 'bends like Beckham'". BBC Sport. 3 August 2012. Retrieved 18 August 2012. ^ Glenda Cooper (9 July 2015). "Steph Houghton: 'I'm still getting used to being recognised in Topshop'". The Daily Telegraph. ^ "Stephen Darby: Motor neurone disease diagnosis forces Bolton full-back to retire". BBC Sport. 18 September 2018. Retrieved 18 September 2018. Wikimedia Commons has media related to Steph Houghton.